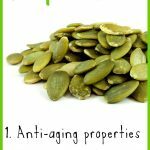 9 Beauty Benefits of Pumpkin Seed Oil for Skin, Hair & Nails - beautymunsta - free natural beauty hacks and more! Though pumpkins are popular, especially during Halloween, pumpkin seed oil isn’t widely known. 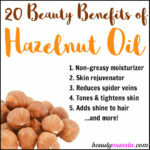 It’s a plant oil that’s extracted from pumpkin seeds and has lots to offer for beautiful skin and hair! Pumpkin seed oil is edible and has actually been processed since the 18th century in Austria and Slovenia. It’s has an intense nutty taste and is used in salad dressings. In today’s post, we’re concentrating on the beauty benefits of pumpkin seed oil! 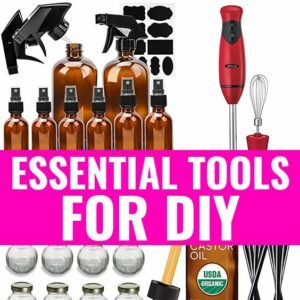 Let’s first check out its ingredient profile then move onto the beauty benefits! Before using pumpkin Seed Oil, do a patch test by applying about ¼ tsp on your inner arm. If there’s irritation within 1-2 hours, do not use the oil. 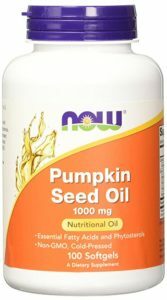 If you’re pregnant or nursing, consult your doctor before using pumpkin seed oil. Store pumpkin seed oil in the refrigerator to lengthen it’s shelf life. Pumpkin seed oil is super rich in antioxidants that promote anti-aging. It has a high level of fatty acids as well. These nourishing nutrients protect the skin from damage and increase its elasticity, making it firm and youthful. The vitamin E content in pumpkin seed oil is also high. Vitamin E is known as the ‘beauty vitamin’ and it promotes healthy and beautiful skin from internally and externally! 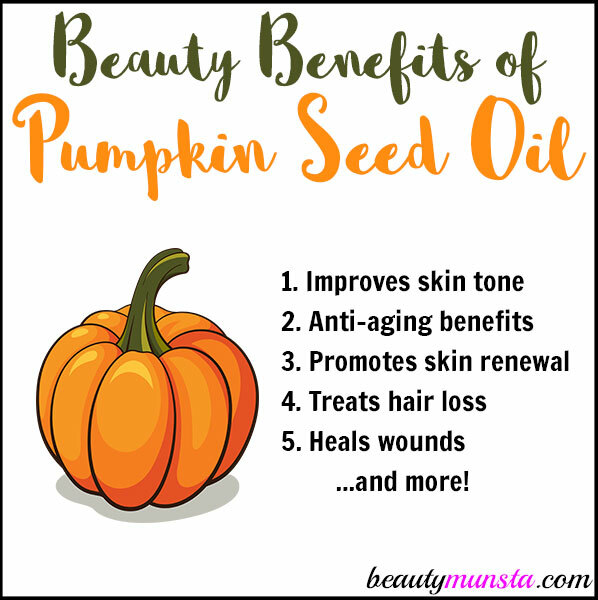 You can choose to apply pumpkin seed oil to your skin or consume it to benefit from its anti-aging properties! Pumpkin seed oil has a nice light and smooth texture that penetrates well into the skin. 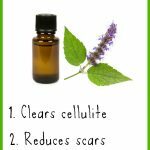 It can be used to moisturize dry skin types. 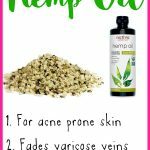 It’s omega 3 and omega 6 fatty acid content makes it a good moisturizing ingredient. And since it has a comedogenic rating of 2, you can still safely use it for any skin type, including oily and acne prone skin. Add just a tsp of pumpkin seed oil to your warm bath and when you come out, you’re skin will be soft, smooth and supple! Speed up the rate at which wounds heal by consuming pumpkin seed oil! It contains Vitamin K, which promotes clotting of blood and heals wounds faster. If you have inflammatory skin conditions like eczema and psoriasis that bleed, consuming pumpkin seed oil can help heal the wounds. It can also be applied to the wounds to lubricate and protect them from germs and irritants. Pumpkin seed oil is said to improve skin tone. It’s no surprise because it is rich in Vitamin A, C and E, all of which promote healthy skin cells. Vitamin C brightens and lightens skin while vitamin A prevents dryness and Vitamin E nourishes and heals problematic skin. If you have dull skin, consider applying a few drops of pumpkin seed oil on your face before applying makeup. Or, consume pumpkin seed oil on a regular basis to see glowing skin! Pumpkin seed oil has actually been proven to treat hair loss. A study published in the 2014 Volume of Evidence-Based Complementary and Alternative Medicine shows that pumpkin seed oil successfully treated patients with androgenetic alopecia (AGA). In the research, 76 male patients with AGA received 400 mg of PSO per day or a placebo for 24 weeks. After 24 weeks, it was seen that the group that consumed the pumpkin seed oil had more hair after the treatment. Mean hair count increases of 40% were observed in the 76 patients while increases of 10% were observed in placebo-treated men. Consuming pumpkin seed oil is a good way to treat alopecia and hair loss. 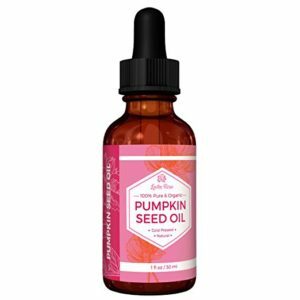 You can buy pumpkin seed oil supplements or drizzle tasty toasted pumpkin seed oil on your salads or use it as a cooking oil to benefit from its hair growth boosting properties! Pumpkin seed oil encourages cell turnover, revealing smooth new skin underneath. It also aids in maintaining the skin’s collagen levels, which keeps skin healthy. The Vitamin E in pumpkin seed oil nourishes the skin cells and promotes their proper functioning. When consumed or applied externally, pumpkin seed oil can boost your hair shine! With its moisturizing properties, it keeps hair looking it’s best. Add a few drops of pumpkin seed oil onto damp hair as a leave-in conditioner. If you’re averse to the mildly nutty scent, you can consider adding a few drops or 1 tsp to your shampoo bottle. Want long and shiny nails? Consume pumpkin seed oil! 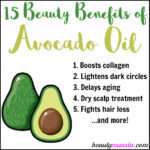 It’s rich in nutrients including Vitamin E that are known to boost nail growth and shine! You’ve probably heard of eating pumpkin seed oil for beautiful nails but pumpkin seed oil in capsule form makes it much easier to consume everyday! You can use pumpkin seed oil as a makeup remover! It has a thinner consistency than castor oil and can help your eyelashes grow long and luscious! Always look for 100% pure high quality pumpkin seed oil without additives. My recommended brand of pumpkin seed oil is Leven Rose’s 100% Pure & Organic Pumpkin Seed Oil. 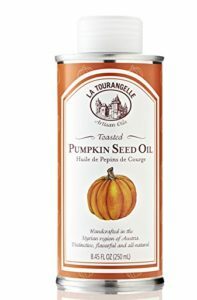 If you’re looking for an edible pumpkin seed oil for internal consumption, buy La Tourangelle’s Toasted Pumpkin Seed Oil. It’s tasty plus a trusted brand! You can also buy Now Food’s Pumpkin Seed Oil Capsules for internal consumption to gain from its beauty benefits from the inside-out! 6 Beauty Benefits of Pumpkin Seeds for Skin, Hair & more!